Andie and I had planned to photograph fireworks tonight but the weather was rainy and overcast. Until briefly, it wasn't. I've learned that when there has been heavy rain and then the sun comes out, opposite the sunset is sometimes a sunrise. So as the sun peeked out, I looked east and there it was! Enhanced a bit with a polarizing filter and then processed in Luminaire to make it a little richer in tone, but it looked quite like this and lasted almost 15 minutes. Update: No. 1 on TT, Week 405! @ukandie1 It didn't clear up for long, but when it did, it was amazing! How spectacular! Lucky you to get this wonderful shot of it. Wowzer! Who needs fireworks? Such a dramatic double rainbow. I love it! Wow! Double Wow! That really is spectacular Taffy! Just showing Barbara the Hancock Tower where I took the photo at sunset of Chicago and Lake Michigan which is hanging on the wall in my hall. I love to look at that view as I come downstairs! I will be back! Lol! Fav for this fabulous image of course! Stunning, it looks wonderful on black. fav. 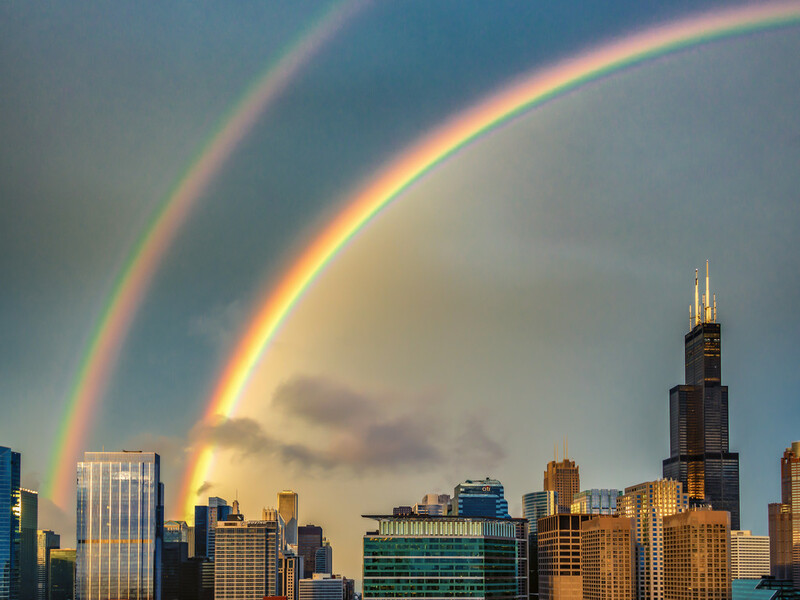 That's a fabulous rainbow shot, I love how the sky looks different in each section between the rainbows. Oh what a fantastic treat! My favourite thing in nature. Nice processing, it's brought its richness out well. super cool, I like how the first rainbow is holding all the darkness behind. Great lighting, not to mention the double rainbow. Love the buidlings in the foreground. Just fabulous, Smithsonian Aerial America has nothing on you! Awesome capture. A gift from heaven. Amazing! Fav. Smart to know exactly where to look to find the rainbow, too. Simply magical, right time and place, fav! Oh what a gorgeous shot! Incredible sight, brilliant shot. There's pretty much a full spectrum on one of those stunning rainbows. Clever of you to know to look behind for something like this. No. 1 TT! Congratulations Taffy! Not surprised to see this fabulous shot in the top spot! @pamknowler Thank you so much for letting me know! VERY exciting! It was such an amazing scene I felt like I was fortunate just to see it, much less capture it. @taffy congratulations on this making the Top of the TT! So fabulous! @louannwarren Many thanks. Very psyched to see it there! Wow congrats on #1 on TT for this amazing capture! Amazing and congrats on the TT Page! fav!